I was recently visiting some old, dear friends in Elizabeth City, NC and while we were enjoying the view of the water we also took a moment to enjoy this sign. 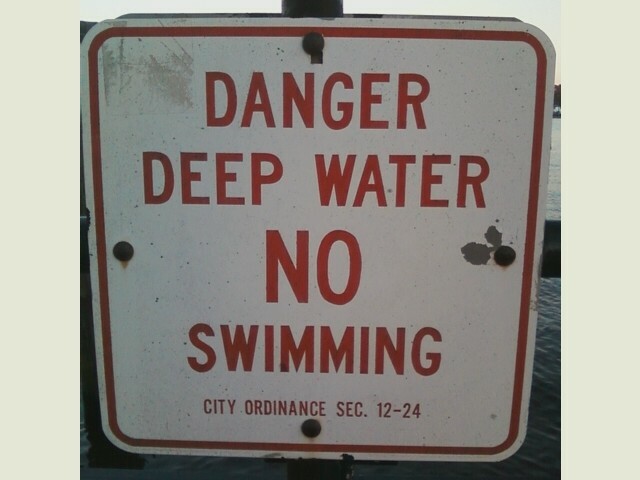 I guess we should restrict our swimming to much shallower waters? 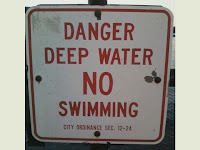 Only swim in shallow water. Perhaps these waters would be more appropriate? I feel that this page is an appropriate ending. Thank you! Crazy, we probably got to see Washington, NC from 1500 feet above! Our friend got us a flight back from a pilot friend of his and we got to see the whole outer banks on a clear day...all the way back to Wilmington! It was really pretty up that way, but the weather wasn't the best last week. Turning...Asian? I really think so. Korean Red Ginseng, Or Crack? Did He See It Coming?